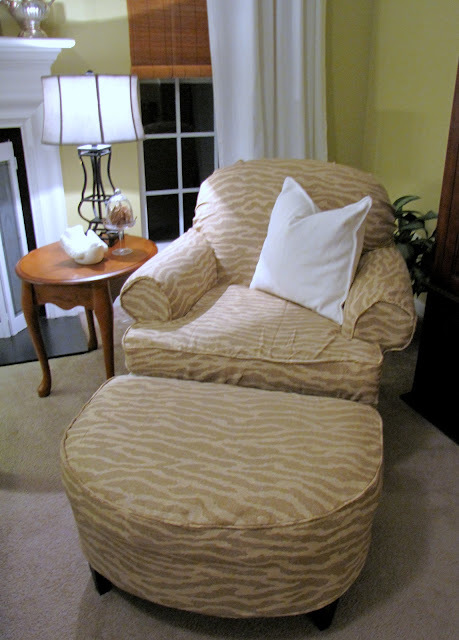 I bought this Hickory Chair Co. chair and ottoman at Goodwill for $35. 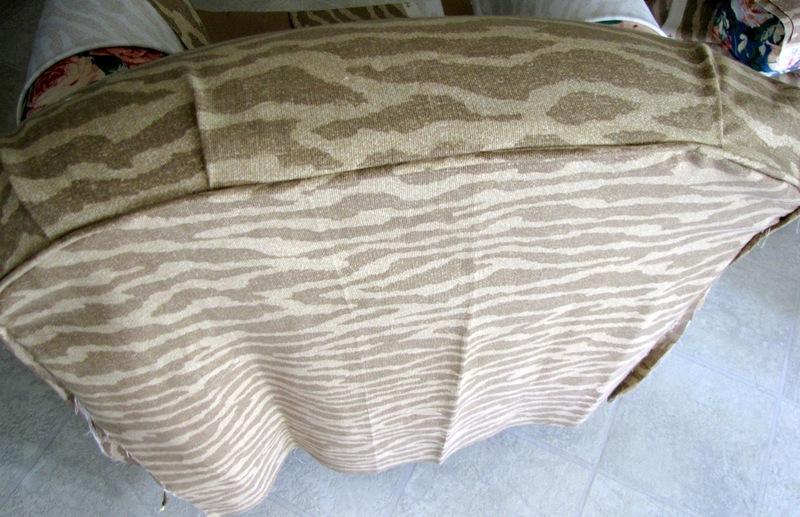 Shortly after that, I found 5 yards of $4/yard P. Kaufmann zebra fabric at Old Time Pottery. I'd say my to-do list is long, wouldn't you? 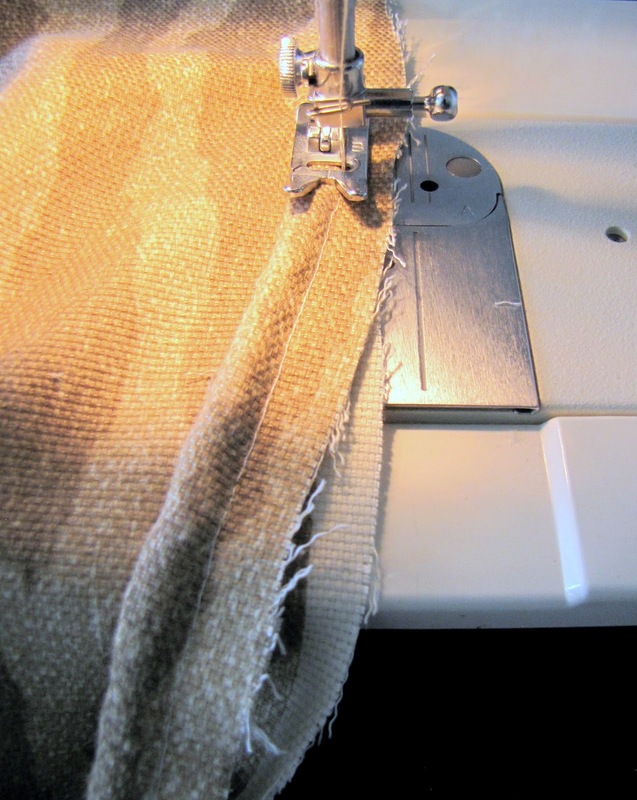 I have been sewing on a sewing machine since I was 13. 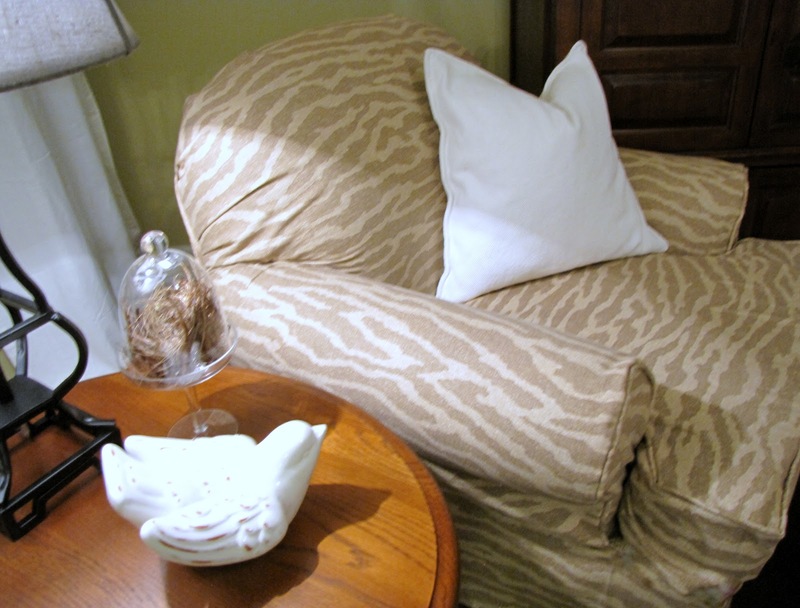 I am not fond of sewing clothes, but I love sewing curtains, pillows, and slipcovers! 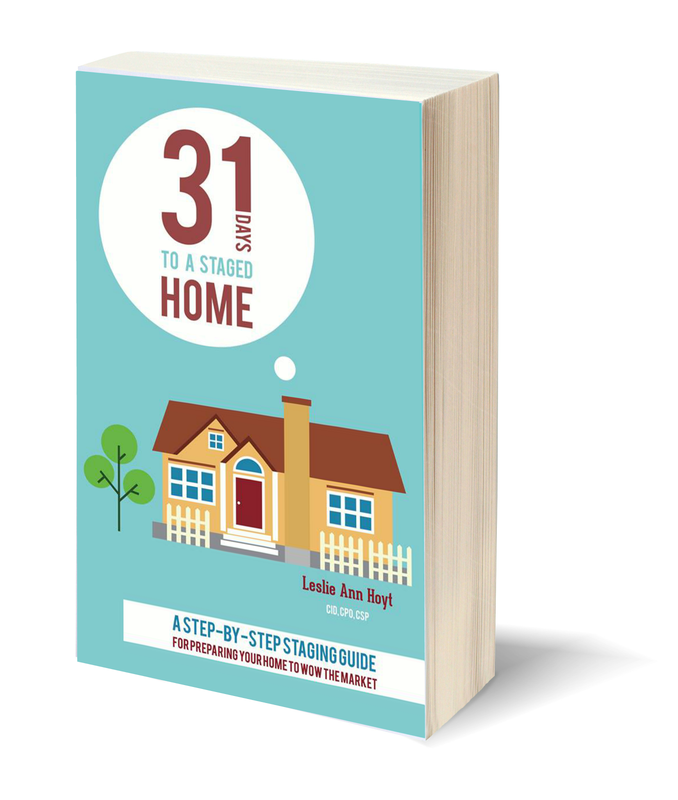 Here's how I tackled this waiting-for-two-years project. First, I had to wrestle (and almost popped off a fingernail! Ouch!) this skirt off, first. and it took me about 1/2 hour to get them both off. But, I did. I won the battle. 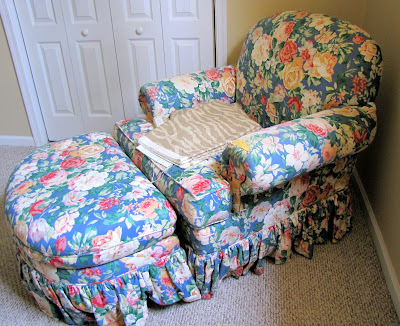 every section of the chair. Lay each piece as flat as you can get it and pin it and trim it. I make the pattern as close to the dimensions as possible. to allow for the seams. making sure the zebra stripes were running horizontal. 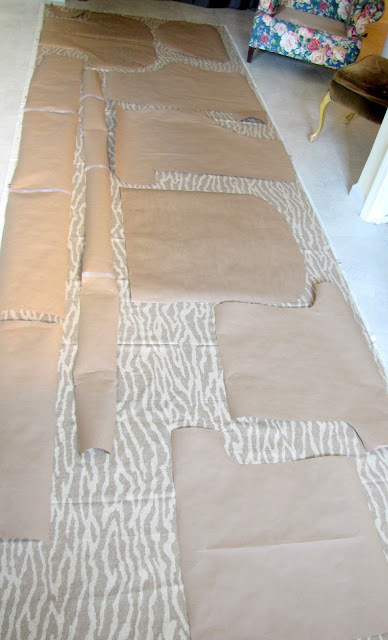 Making the pattern and laying it out took two hours! All the pieces are accounted for. sunny days to finish this project so I could take better pictures. 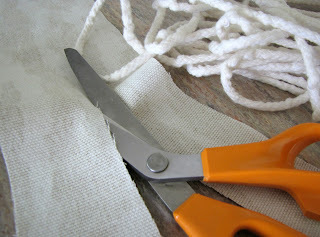 After cutting out the pieces, I made cording with 3/8" cording. I believe I ended up sewing 18 yards of it. and sewed all their short ends together. I did this for a long while. 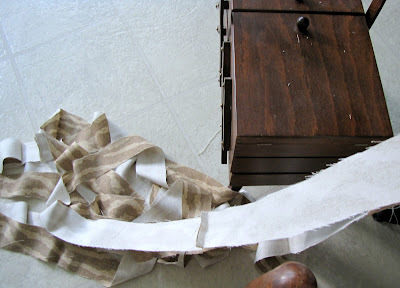 Then I sewed the cotton cording inside the strips for an even longer while. 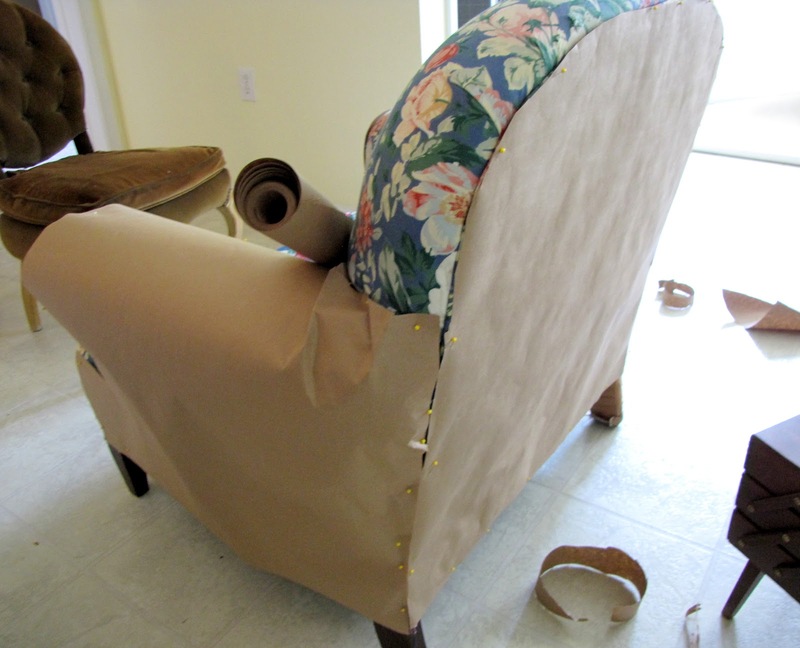 I always start by pinning the piping at the top back part of the chair. 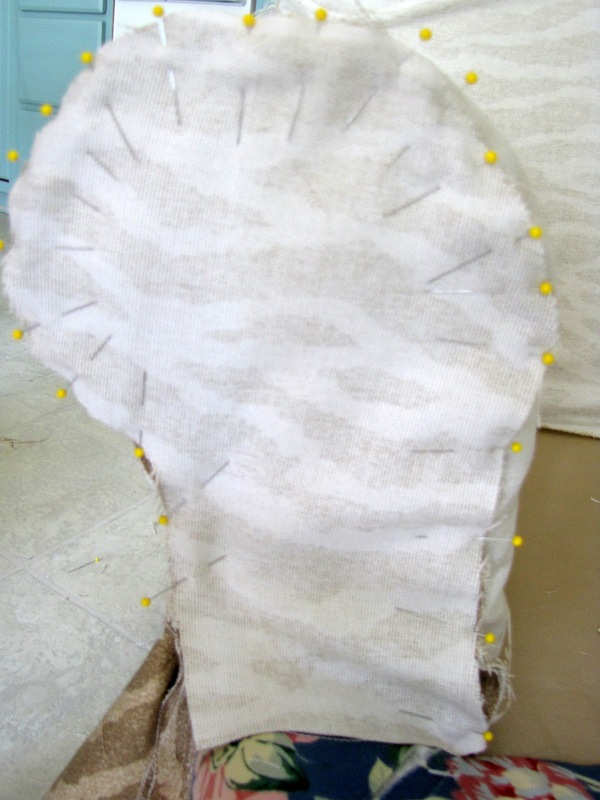 and the back pattern side of the chair got pinned the other side of the same piping. Now it's right side out. And I pin the arm pieces to it, wrong side out. 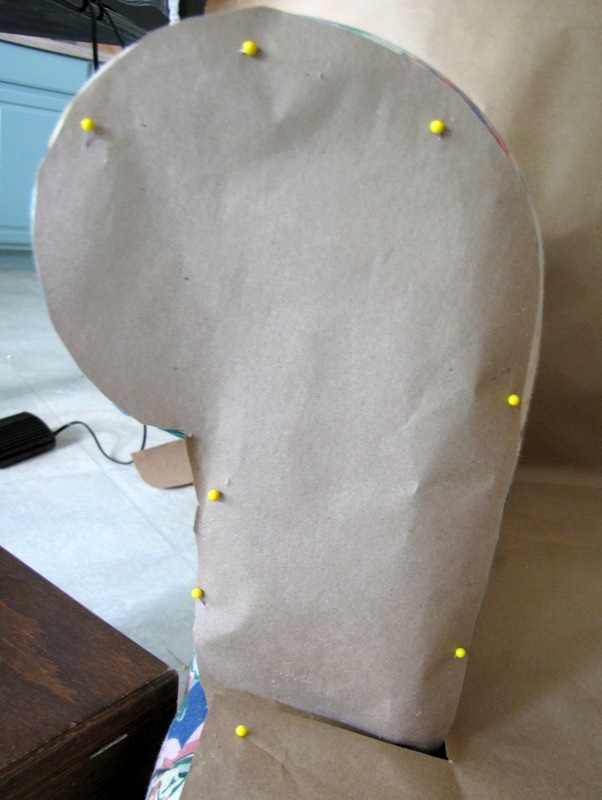 And the arm pieces get gathered a tad so they curve the arm of the chair. Take the slipcover off and sew the pinned area. 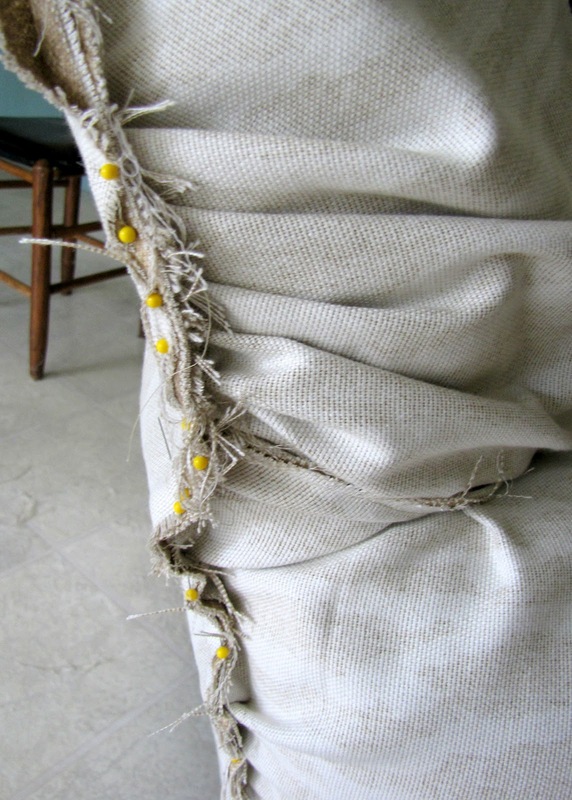 Turn it right side out, fit it back onto the chair. Turn it inside out and pin another pattern piece to it. See? I don't have a fancy machine! Just a simple, older, sturdy, portable Singer that was my grandmother's. I used part of a painting tarp as the pattern for under the cushion. No one sees it anyway. 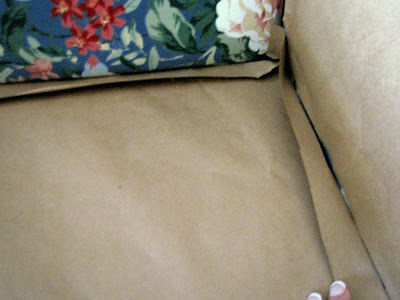 I used velcro on my seat cushion flaps to hold them together. I am also not fond of sewing zippers. The ottoman gets its cover. 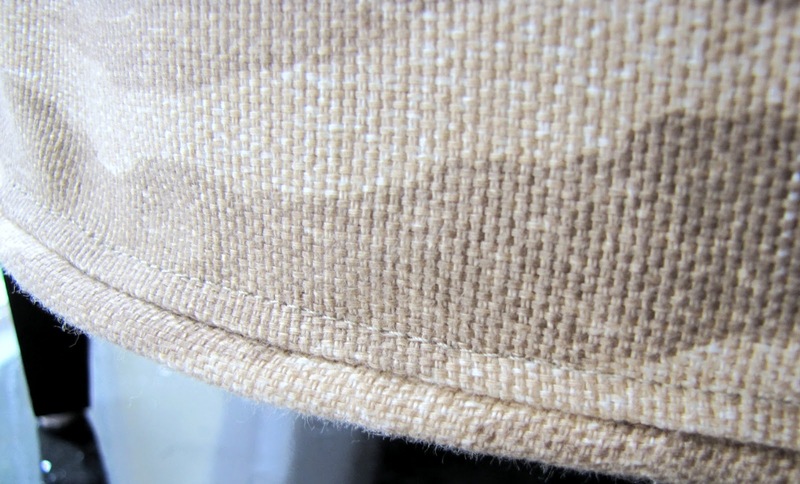 I trimmed off the selvage and added piping to the bottom. 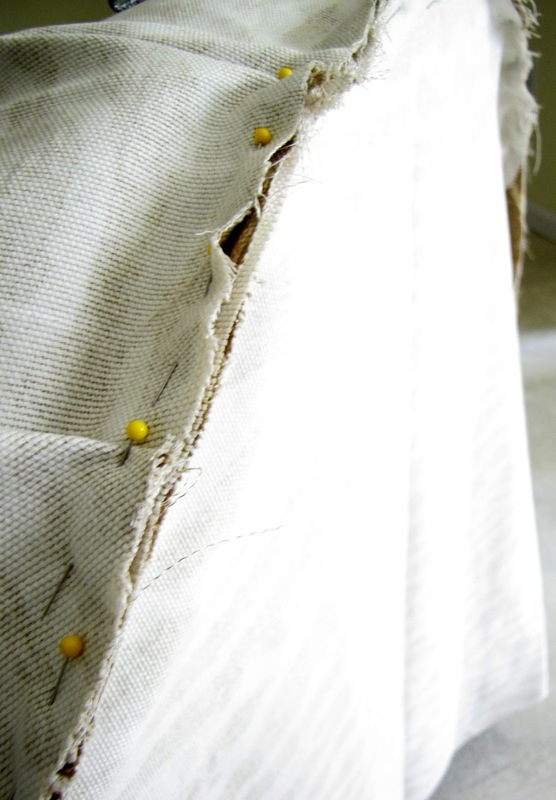 I top-stitched all around the bottom, just 1/4" above the piping so it would lay flat. 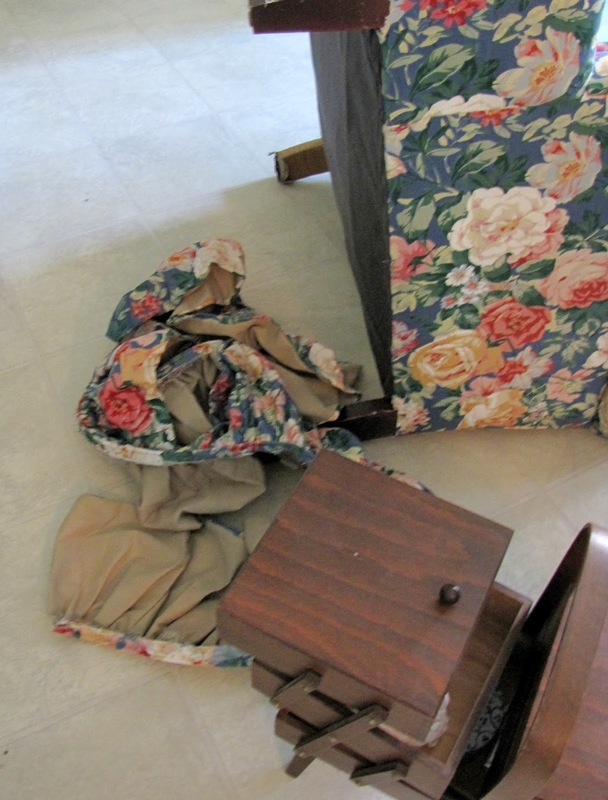 So, Laura Ashley meet Ballard Designs. I finished it at night and couldn't wait to get the long-awaited after picture. It's now my cozy blogging and reading spot. I am happy to have this project off my list! The fabric is P. Kaufmann Sierra Skin. I found it at Old Time Pottery for $4 a yard. I used 5 yards. Ballard Designs also carries a similar design by the yard HERE. It turned out AMAZING Leslie! 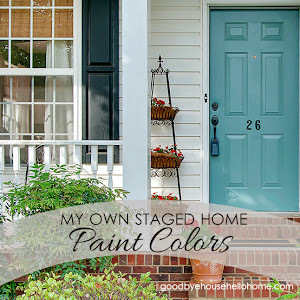 What a lot of work but such a great deal and I'm sure you will enjoy it for a long time after all the effort you put into it. Enjoy! I LOVE IT!! Such a pretty fabric! Thank you so much for this I have a chair which is a badly dyed barbie pink that I hate. I've got some lovely brown n after your blog (and 3 years procrastination) I now feel its something I could tackle! 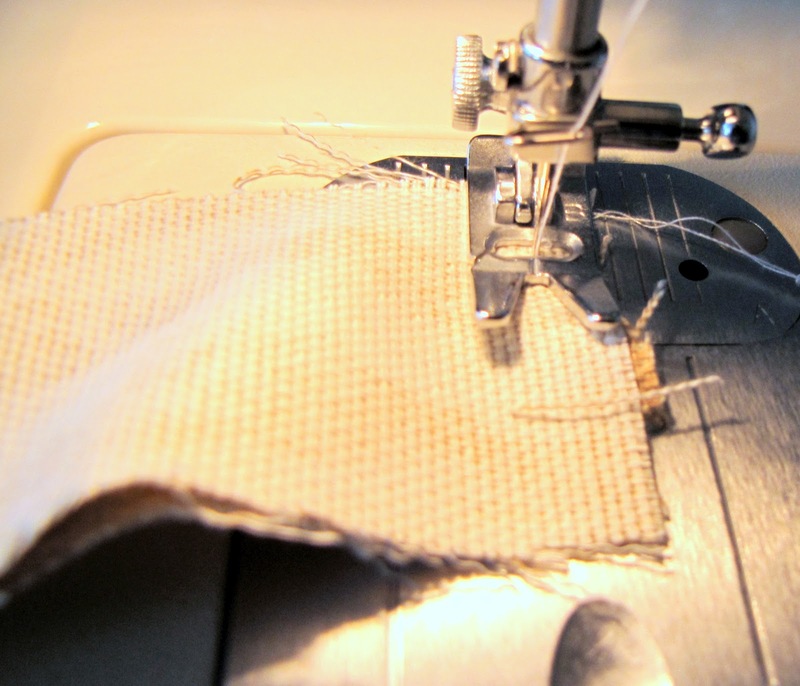 I do sew! Lots of things! One thing that has always filled me with fear is piping -- what size needle did you use in your machine? What a great finish! 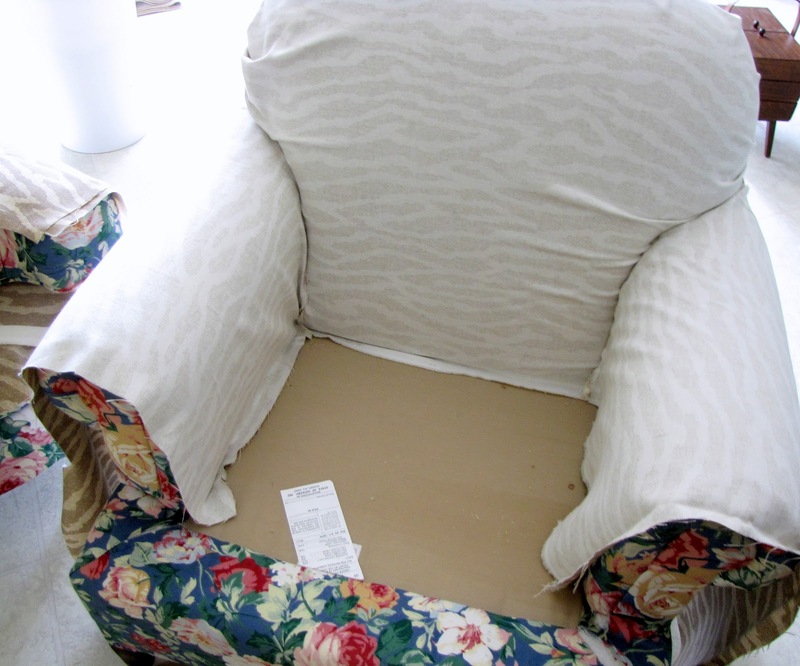 I love your professional approach to your slipcover. I am a bit impatient for that but I can see how the results are so much better. Yes I sew and quilt as often as I have time. 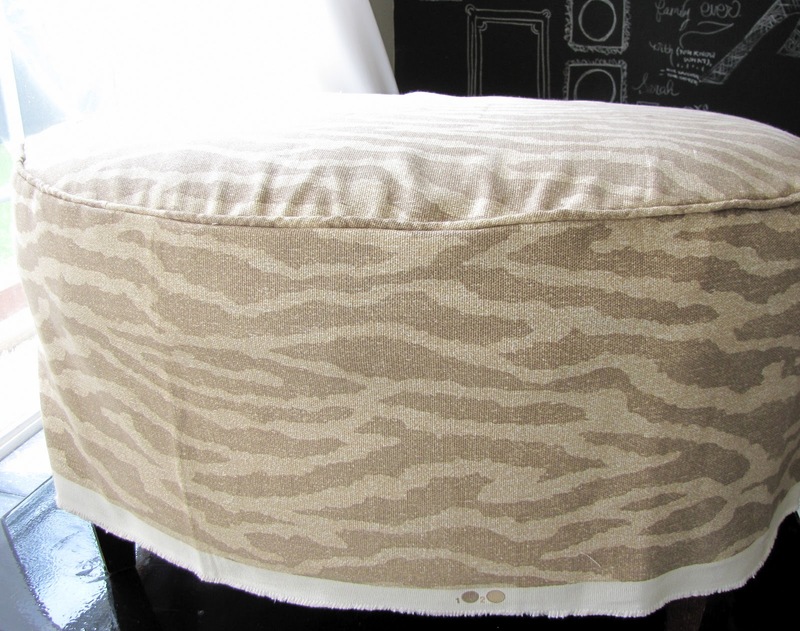 Slipcovers are not my favourite but I have made several for chairs and sofas. 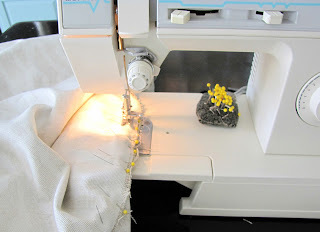 Girl, I sew a LOT... but this tutorial was sooooo helpful. I have a great slipcover book, and I have even re-upholstered a sofa (in the '90s-- my first-- in PLAID! AAAAACK! WHAT WAS SHE THINKING?) with a NON-electric staple gun. *ouch* But this post was great. And your chair sure turned out precious. And to think you blog and read and think and study there. What a bargain you got, girl. Two years later, even better! Back to what I've sewn: clothes, pjs, curtains, bedcovers, dust ruffles, baby bed bunting, duvets, oh, why did you have to ask that?! Hi there! Wow! This is cool. Thank you so much for sharing this one. You have such an awesome page! I'll be looking forward for your other posts as well. Keep it up! 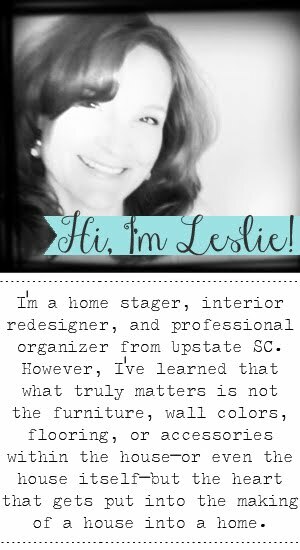 This blog could really help me out with my business. 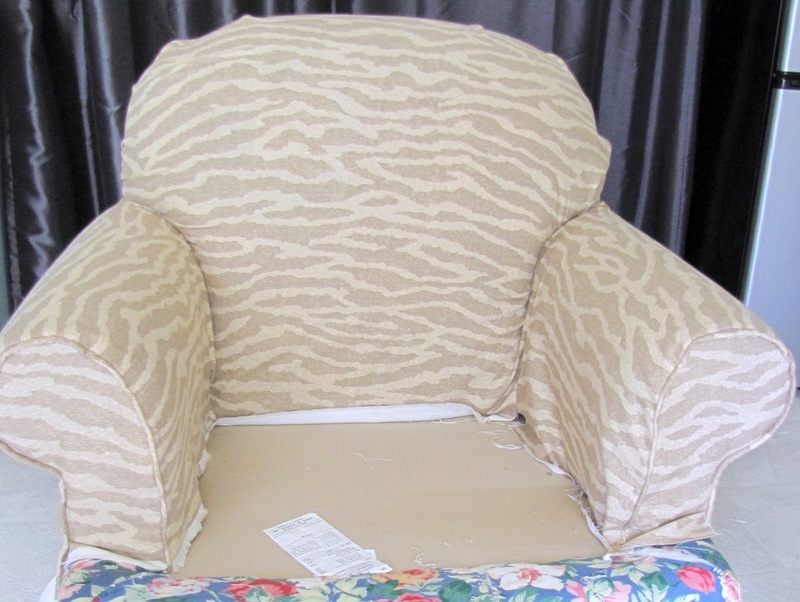 As this new "looser" fitting style of slipcovers do not always require custom tailoring, some furniture manufacturers are beginning to offer "ready made" slipcovers. 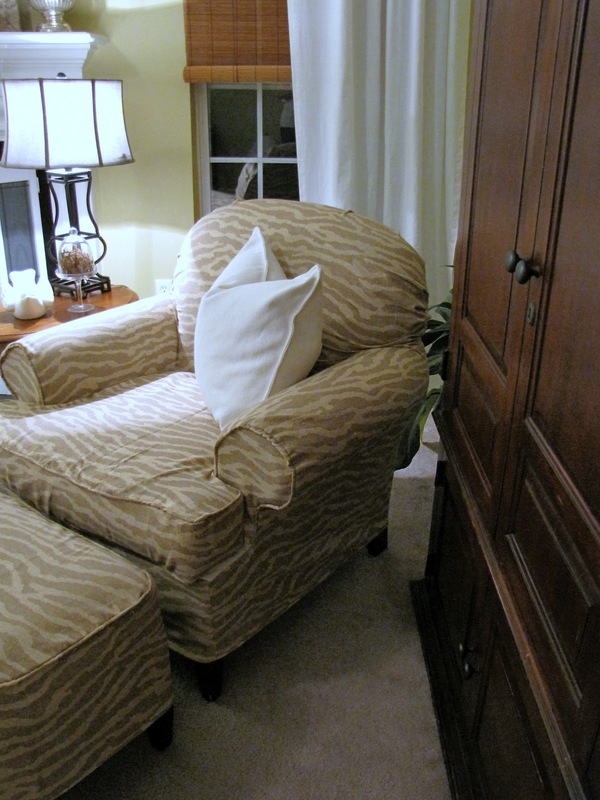 Call for an appointment for our shop-at-home services or come visit our showroom in Peabody. Thank you so much for this awesome tutorial! My husband is not fond of the slipcovers I have attempted in the past ("They still look like slipcovers") so this is a welcome option for making over my ugly (but comfortable) couch, oversized chair and ottoman. Thanks for such an awesome tutorial! I have made slipcovers in the past, but my husband was not happy as "they still look like slipcovers." This is a wonderful alternative! Raid the toolboxes in the garage. A small prybar would make removing the ruffled easy. I loved your paper pattern. 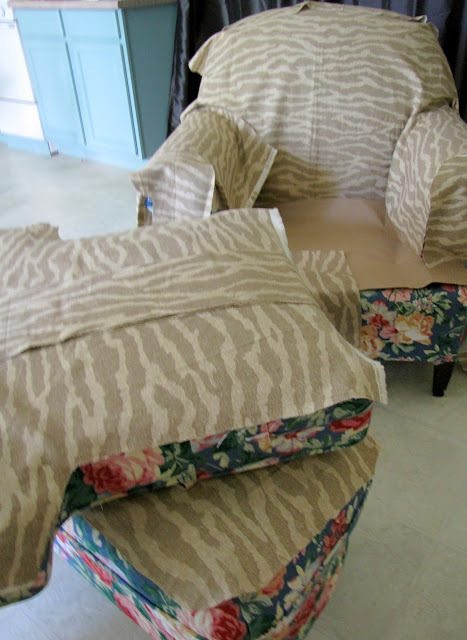 I started a slipcover (about 3 years ago) by tearing apart the old cushion covers for the seat and loose back cushions to use as my pattern. 1. It took a long time to deconstruct, and 2. 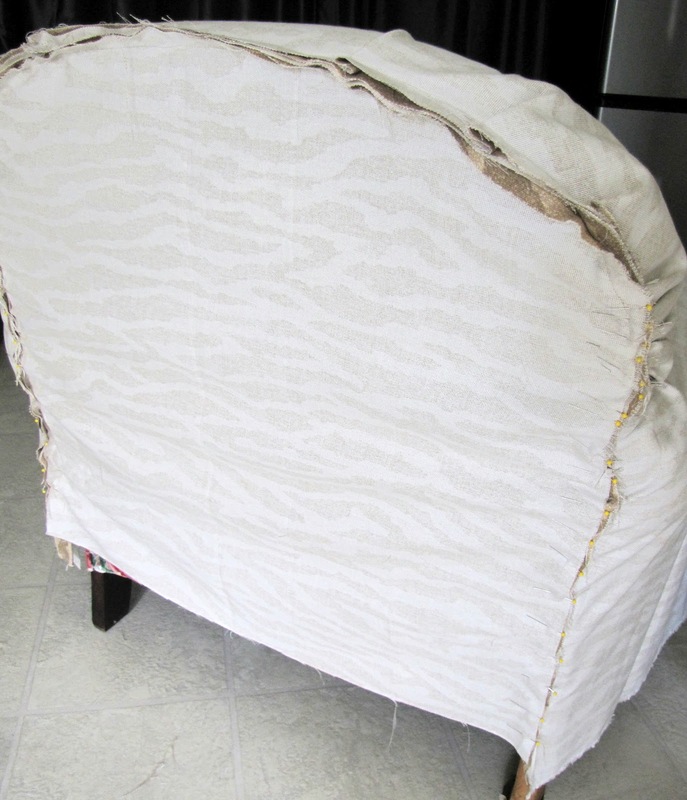 The new cushion covers were loose because I didn't adjust for years of stretched fabric. 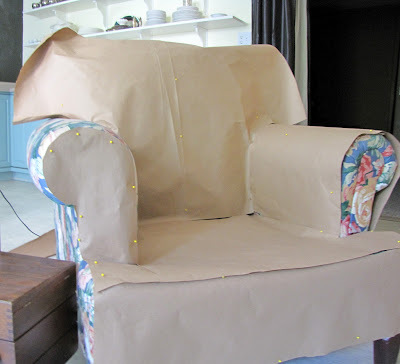 I never finished the chair's slipcover but will get back on it after seeing this tutorial. Thanks! Wow this is so helpful.. and motivating! I've been scared to tackle a mauve rocker... but now I need it for a nursery soon, so I'm so glad you shared this! Thank You!!! This is just what I was looking for. And might I say your results are great! 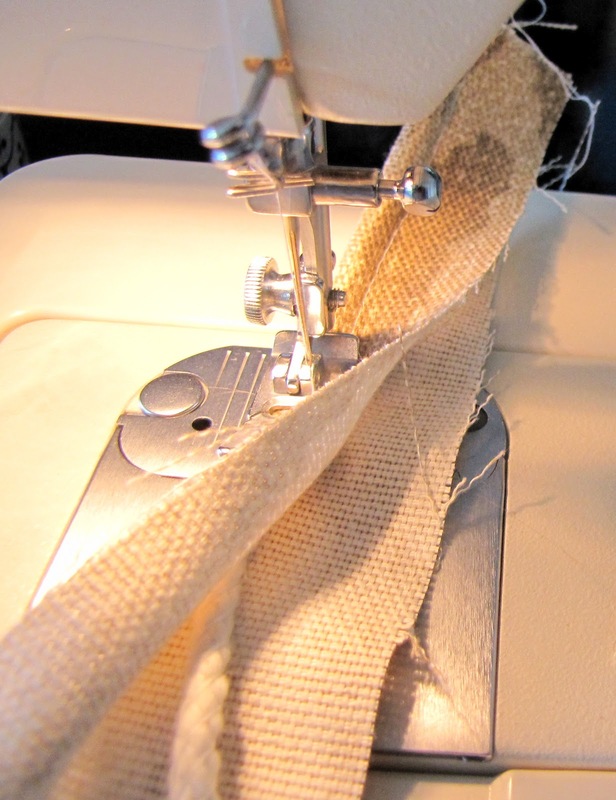 I have sewn my whole life it seems, and love sewing pillows, drapes, etc. Now ready to add slipcovers to the list!. I just found this and I have really been looking for some good instructions. These are so clear and I believe will be easy to follow. Thank you so much for sharing this with us. Such a helpful, thorough tutorial. Thanks for your time and all the effort to share! The end result looks great! Amazing job, don't like the material but that is personal! Off to Spotlight to get some material and do the same, thank you for the great tutorial, been waiting to resew slip cover on my 2 1/2 seater, grandkids tore the top open on one arm and I don't want the lining material to rip so off I go! kudos to you for a job well done!!!!! I just loved your instructions and what a great job you did. 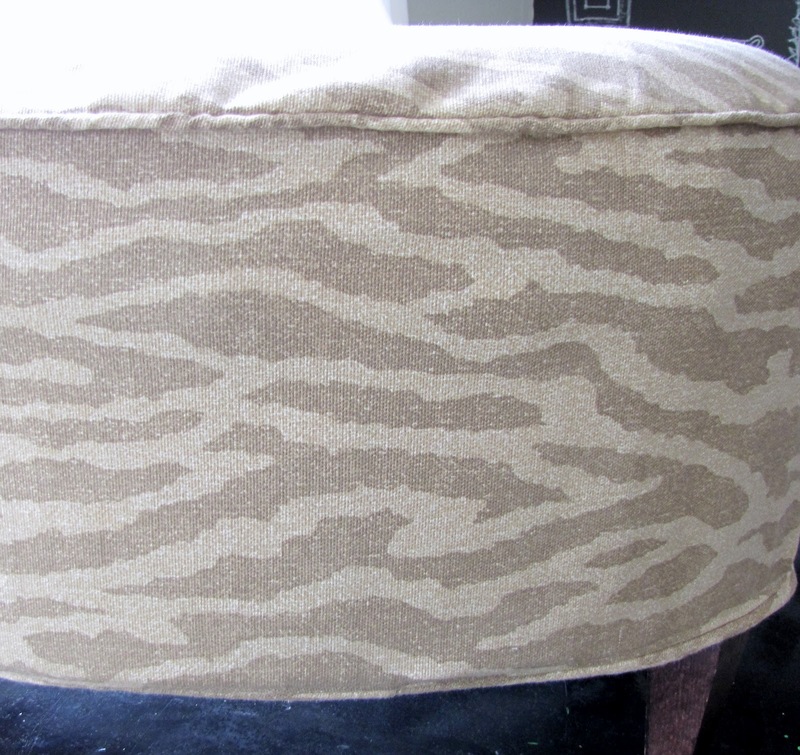 The chair and ottoman look professionally finished. 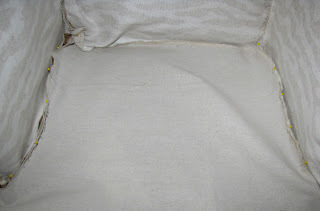 Actually it is the best tutorial on slip covers I have found and believe me, I have looked high and low for a good one!! I have been sewing something or another for about 60 years and still find it to be my favorite hobby. I am happiest when I am sewing or doing anything with fabric. LOVE IT!! The first thing I made was a blouse with self binding at the beck and arms. I was nine and my grand mother insisted I make a pattern to my measurements out if plaid fabric and sew the entire thing, matching up plaids of course. 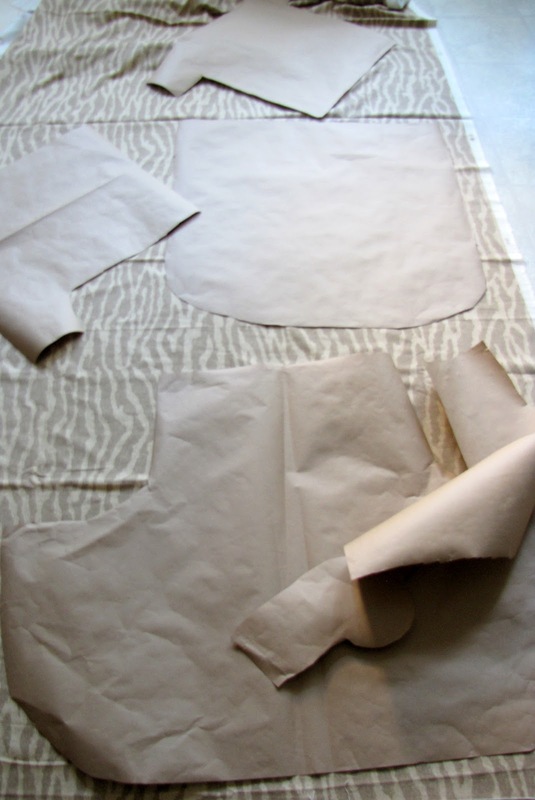 From there I made aprons, clothing for myself, 3 daughters and husband to include a 3 piece suits for my husband. Also lined and unlined drapes, curtains, pillows and duvet covers with shams and entire crib sets to name a few. 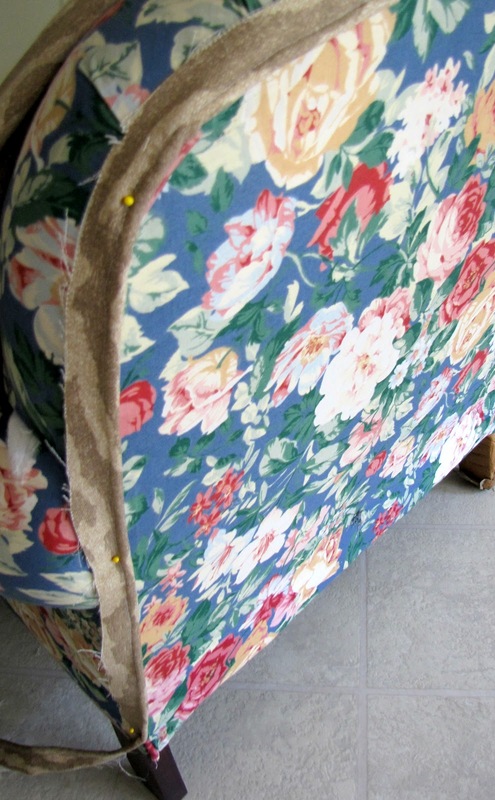 I have also upholstered my share of furniture and made a few slip covers. 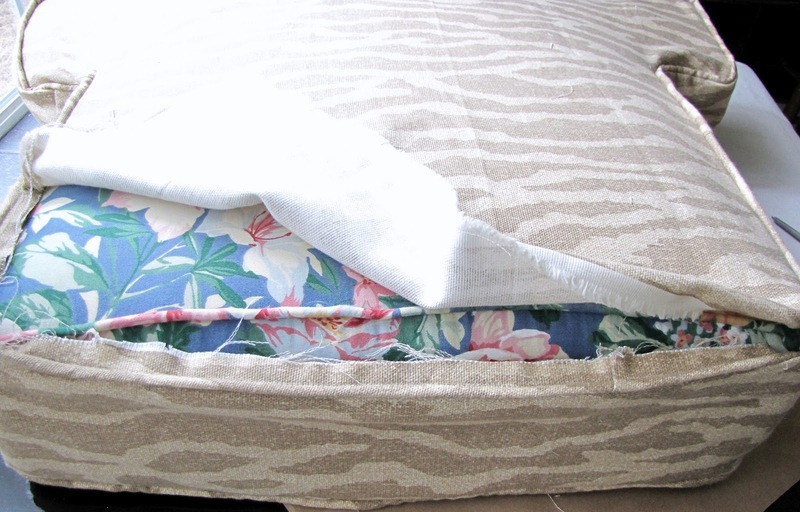 None of my slip covers turned out as nice as yours and took a lot more time and effort the way I did them.